JAKARTA – Indonesian police announced on Wednesday (Nov 16) that Jakarta Governor Basuki Tjahaja Purnama had been declared a suspect over alleged blasphemy, an offence that carries a maximum jail term of five years if a district court declares him guilty. President Joko “Jokowi” Widodo, a former carpenter, is taking his opponents into a game of political chess. A decision by the police to name incumbent Jakarta Governor Basuki “Ahok” Tjahaja Purnama a suspect for alleged blasphemy may have well been a calculated risk — a necessary evil to secure bigger political gains. 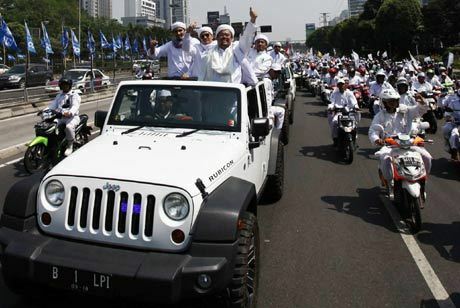 Habib Rizieq Shihab the leader of notorious FPI (The Islamic Defenders Front) and his convoy proudly parade on US made Jeep Rubicon, a highly priced vehicle for average working class Indonesian. “Police have decided to declare Basuki Tjahaja Purnama a suspect and bar him from travelling abroad,” national police chief detective Ari Dono Sukmanto told a media briefing, explaining that there was, however, dissenting opinion among the 27 police investigators assigned to investigate the case. Realizing the sheer scale of the movement, Jokowi has since consolidated his power by visiting the headquarters of the Army, the special forces and the police, as well as by meeting leaders of the top Muslim organizations and the Islamic parties in his coalition. Perhaps Jokowi’s roadshows are not only aimed at forging “better communications”, but also at signaling that the President means business; unconstitutional attempts to destabilize a legitimate government and devastate the nation’s unity will not be tolerated. Although Jokowi believes “political actors” to be behind the violence, pressure remained to have Ahok prosecuted or even jailed because of the case, with many groups planning a larger rally for Nov. 25, if their demands are unheeded. The Indonesian government are already concern that the previous rally and the upcoming one are not only about Ahok but also about attempts to coerce the President into complying with the demands of the few for a “bigger slice of cake”. Some may have called it a “mini coup” attempt, but it was actually merely pressure by several politicians (including from political parties in Jokowi’s ruling coalition), state officials, public figures, religious luminaries and activists who have been starved of resources since Jokowi took office in 2014. The movement has somehow attracted a swath of naïve conservative Muslims into the fray, thus creating a snowball effect that if not immediately contained may have the potential to ignite sectarian conflicts that may undermine the presidency. As calls for Ahok’s prosecution continued unabated, Jokowi may have had no other option but to allow police to name the governor a suspect and then tell him to hang onto the edge of the cliff while the President takes out his enemies one by one before coming back to rescue him. It may be naïve to think that the police, an institution under the auspices of the President, made the decision without receiving prior consent from Jokowi, who may have even instructed the decision to be made so as to give him an edge. First, the decision will calm conservative Muslims and perhaps deter them from hitting the streets in another rally. An unintended casualty in the rally, such as a killed protester, would wreak havoc on security in the capital as the protesters would flare up and commit violence in revenge for their fallen mujahideen. Second, as demands from the conservative Muslims to have Ahok prosecuted have been met, the police will no longer hesitate to take stern measures against religious figures and activists, as well as against their financiers, who provoked the violence in the Nov. 4 rally. This includes demands for the prosecution of Buni Yani, a communications lecturer, for allegedly inciting hatred after he distributed a video of Ahok uttering the alleged blasphemy and uploaded part of it onto his Facebook page with a provocative heading. The video contains footage in which Ahok speaks to residents and city officials in the Thousand Islands about voting rights. The governor cites Al-Maidah, verse 51 of the Quran, which has often been used by politicians to deter Muslim voters from electing non-Muslims. Free-riding politicians, who have been toying with religious sentiments by using issues related to Ahok to their advantage, will not likely be left out of the loop. Former president Susilo Bambang Yudhoyono is a particular person of interest for Jokowi. Yudhoyono’s son, Agus Harimurti, is competing with Ahok in the Jakarta gubernatorial election and Yudhoyono publicly attempted to erode the possibility of Ahok winning the race with an irresponsible intervention into the furor surrounding the governor and the alleged blasphemy, demanding a trial in a tone that contained more than a hint of provocation. Third, the suspect status will actually give an advantage to Ahok’s camp as some part of the public will perceive him as the victim of a miscarriage of justice and this will garner him more support in the election. Using religious sentiment for the selection of leaders does not sell well in Jakarta and the Nov. 4 rally was actually dominated by participants from outside the capital. Fourth, the governor’s status has proven to the public that Jokowi is not protecting Ahok, as the President has taken sides with the demands of the conservative Muslims. How can Jokowi, raised in a secular environment in Surakarta, Central Java, where Javanese mysticism runs high, then return to prevent Ahok from falling off the cliff? Ahok’s prosecution will be a complicated one, and it could take years for the case to be final and legally binding. Even after the police have wrapped up their investigation, the case should be processed by the Attorney General’s Office, which is helmed by a senior politician from the NasDem Party, a member of Jokowi’s coalition and the first party to endorse Ahok as a gubernatorial candidate. But despite all the troubles, Jokowi may have a claim to victory as he can now identify friends and foes within his government and coalition, prepare his “cleansing measures” against the opponents and gain more support from conservative Muslims — the only group from which Jokowi is lacking support. Mr Basuki and Mr Djarot are up against the Gerindra Party pair of former education minister Anies Baswedan and businessman Sandiaga Uno, and former military officer Agus Harimurti Yudhoyono – son of former president Susilo Bambang Yudhoyono – and veteran bureaucrat Sylviana Murni. 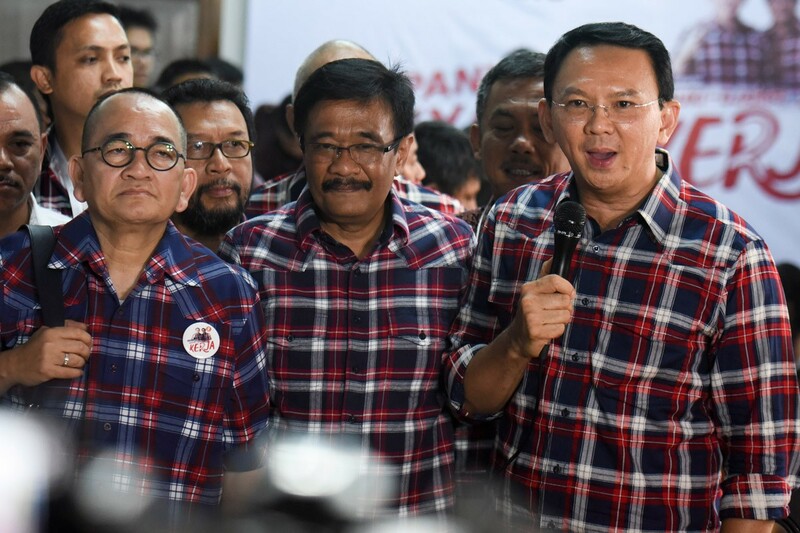 Mr Basuki’s campaign team earlier said that the incumbent governor will still run for the gubernatorial election next February even if he is named a suspect. Despite the heat Mr Basuki has received in recent weeks from Muslim hardliners, he remains hugely popular. The coalition led by the PDI-P has also closed ranks behind Mr Basuki after the protests to fend off calls for him to be sacked.